The Temple of Artemis at Ephesus (Turkey) was one of the most elegant buildings of ancient times. This Seven Wonder was erected around 600 BC and burned down in about 550 BC. It was then rebuilt into a bigger and more magnificent version. The Temple of Artemis was destroyed again in 336 BC, this time by an arsonist named Herostratus who wanted to immortalize his name (2300 years later it appears he succeeded). 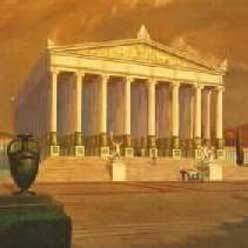 The temple was again rebuilt, even bigger and better than before. Except for its lumber-supported roof covered with glazed terra cotta tiles, the new Temple of Artemis was made almost exclusively of marble (a first in its day). Inside, the temple was richly decorated with sculptures and other artworks created by leading artists. It more or less survived intact until the invading Goths severely damaged it in 262 AD. What remained of this Seven Wonder slowly disintegrated with the help of earthquakes. By the 5th Century AD, most of the marble had been salvaged for local building needs. When I explored the Temple of Artemis site 15 centuries later, all that remained was one reconstructed column (of uncertain origin) and a marshy field strewn with large chunks of marble (that may or may not have belonged to the Temple of Artemis).